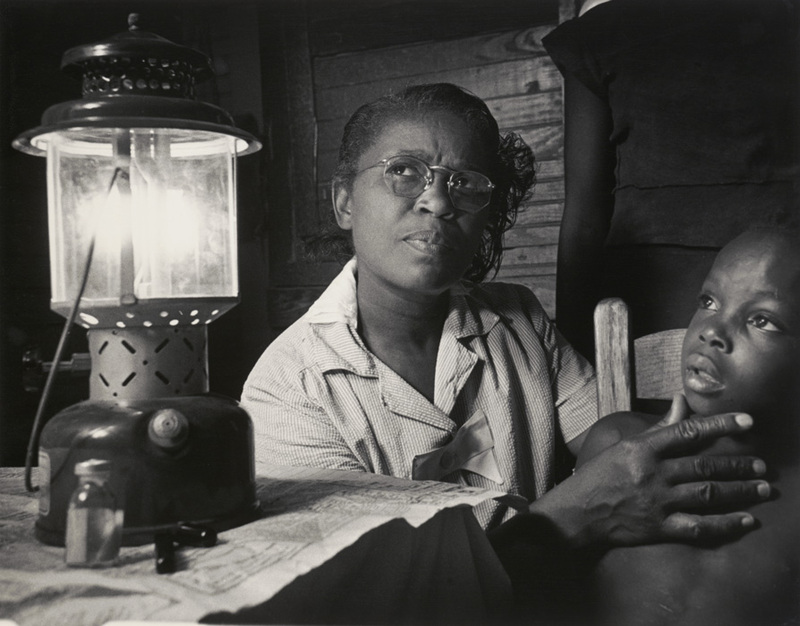 W. Eugene Smith’s Midwife Maude Callen with sick child is part of his 1951 “Nurse Midwife” series, portraying the 51-year-old South Carolina nurse midwife’s tireless service on behalf of poor, rural blacks. Charles Moore’s Birmingham Riots (1963), showing protestors being sprayed with water hoses by the Alabama Fire Department, captures police brutality toward African Americans. Nelson-Atkins photography exhibit revisits the historic struggle for civil rights. Blackness has always been a spectacle. It’s always been a groundbreaking news story, movement or piece of art. Photographers such as Danny Lyon and Bruce Davidson made blackness newsworthy, and photographers such as Gordon Parks and Roy DeCarava made it beautiful. And while attending the “Through The Lens: Visions of African American Experience 1950-1970” photography exhibit at the Nelson-Atkins Museum of Art, I came to know how much of a positive spectacle blackness could be. Separated into three sections, the exhibit features seven photographers, two of whom are African American. “Bearing Witness” includes work documenting the civil rights movement by Lyon, Davidson and Charles Moore. “Telling Stories with Pictures” features photo essays of everyday American life by Parks, W. Eugene Smith and James Karales. 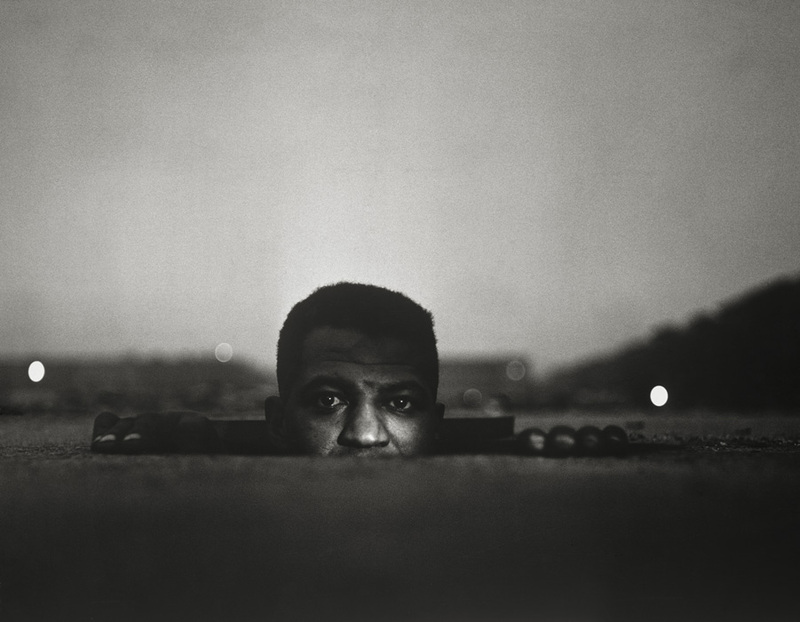 “Expressing an Artistic Vision” includes images by Parks and DeCarava. “The idea was to feature bodies of work by seven different photographers who were all discovering different facets of African Americans during that time period,” says April Watson, curator of photography at the Nelson. The exhibit also includes an interactive portion for attendees. Using a touch screen, viewers can match exhibit photos with pictures from the 2014 Ferguson protests, and then provide their reasoning behind it. The photographs in the “Bearing Witness” section are very provocative, highlighting protests for blacks and violence against them. And they are very reminiscent of the Ferguson protests. In Lyons’ Arrest of Taylor Washington, a black man, presumably Taylor Washington, is trapped in a headlock by a white police officer. His mouth is open wide, most likely because he is gasping for air, or screaming, or both, with one hand grabbing the officer’s arm that is around his neck, and the other bent at an angle, as if he was in the motion of running. The officer looks unbothered, and full of unstrained strength to make an effortless arrest. Moore’s photos of the Birmingham protests in 1963 make for a sharp climax to the “Bearing Witness” storyline. 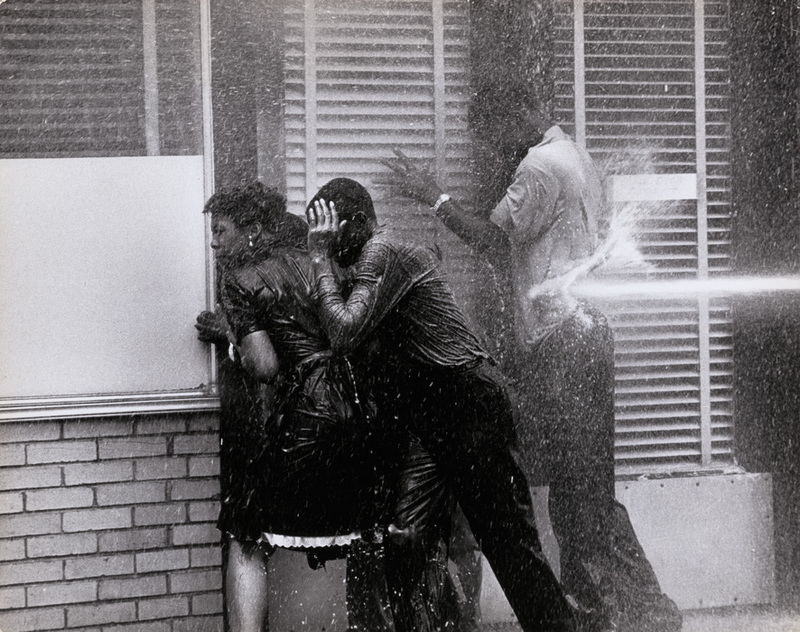 His famous photo, Birmingham Riots, shows protestors being sprayed with water hoses by the Alabama Fire Department, continuing the theme of police brutality toward African Americans. Then there is Davidson’s work, which beautifully captures the economic disparities in black neighborhoods in East Harlem in 1966. One of the most intriguing photos in this section shows a young, black couple directly facing the camera. The woman is agreeably smiling, but the man is not. With wide eyes, he stares directly at the camera, almost emotionless—not happy, but not sad—most likely a common attitude among African Americans at that time. Taken in 1951, his images show Callen’s tiresome duties in the service of mostly poor, rural blacks in healthcare concerns, and more. One picture shows Callen assisting a blind man to pay for his items at a store, one of many tasks she would often perform. This story didn’t just humanize black people, but more specifically black women, whose importance during the Jim Crow era often went unacknowledged. The photographers featured in this portion of the exhibit not only aimed to humanize black people, but to give them a voice, highlighting black human rights at a time of hope for their advancement in society. Karales excels in this approach in his “Rendville, Ohio, 1956” photo series. One photo shows an African-American boy walking across concrete, seen from an aerial perspective that places him underneath the shadow of a building. In the forefront of the picture is a wooden power line with a sticker that reads “citizen.” The image is symbolic of the entire purpose of the civil rights movement: equal citizenship. The last dividend of the exhibit is “Expressing an Artistic Vision” featuring Parks and DeCarava, the only African American photographers of the seven featured in the show. The photos of Parks and DeCarava are mesmerizing, possessing a quality much different from the aforementioned five. In Hallway, a piece in his 1953 series of everyday life in Harlem, DeCarava captures a poorly lit, narrow hallway. The image is haunting and imaginative, symbolic, perhaps, of the unsure future for African American equality at mid-century. Parks, too, focused on everyday life for black people at the time, but transformed the subject into art. Department Store, taken in Mobile, Alabama, in 1956 and one of the only color prints in the exhibit, shows a young black woman and a black girl dressed in elegant lace ensembles; the woman in mint green and the girl in ivory. They patiently stand underneath a “Colored Entrance” sign, unbothered. With this photo, Parks showed the elegance and beauty of black culture, themes rarely highlighted in photography. Parks and DeCarava’s photos possess an essence of blackness that the other five photographers could not possess, because, unlike them, Parks and DeCarava were not just documenting blackness, they lived it. “Through The Lens” shows the good, bad and the ugly sides to being black in America more than a half century ago, but it also shows the beauty of it. And for that, these pictures speak volumes. “Through The Lens: Visions of African American Experience 1950-1970” continues through April 3 at the Nelson-Atkins Museum of Art, 4525 Oak St. Hours are 10 a.m.-5 p.m. Wednesday, Saturday Sunday; 10 a.m. to 9 p.m. Thursday and Friday. Admission is free. For more information, 816.751.1278 or www.nelson-atkins.org. All images courtesy The Nelson-Atkins Museum of Art, gift of Hallmark Cards, Inc.
Ieshia McDonald is a graduate of the University of Missouri School of Journalism. She resides in the Kansas City metro area, where she teaches, blogs and writes poetry.